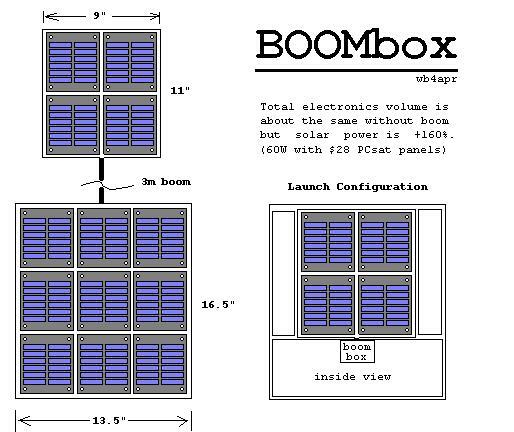 The MIM Module: The simplest Telemetry module is the MIM module shown below which provides for multiple periodic AX.25 packets at 1200 baud AFSK. Different rates can be set for the BEACON, Telemetry, GPS position and CW Identification. The module has no comand and control capability, but that is easily added with CTCSS or DTMF receivers/decoders in about the same size package. 1200 Baud TNC: The second and much more capable telemetry is the use of a Kantronics KPC-3PLUS TNC carved down to fit within the four inch cube. As can be seen in the photo below, the board will fit diagonally if the connectors are removed and the power supply portion of the board are relocated. 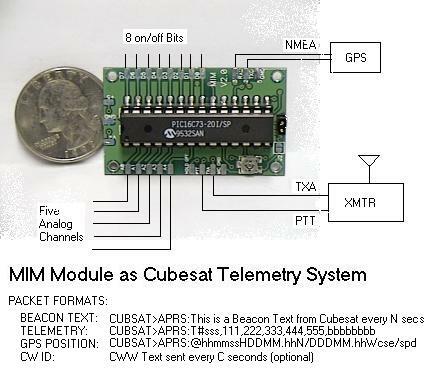 This gives the same Telemetry, Beacon, GPS and CW ID capability as with the MIM module, but includes a full TNC DIGIPEATER and 4 channel COMMAND/CONTROL channel as well. 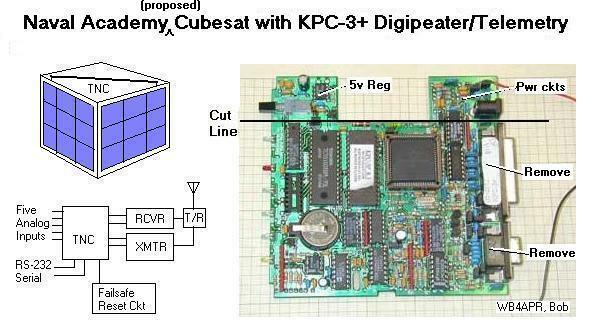 With the full TNC, a complete digital communications transponder mission, such as PCSAT, can be supported. PCsat is just one of a possible constellation of student built satellites supporting the ASTARS Mission. The ASTARS Mission is a generic mission to provide real-time message, position, and status relay via satellite to a worldwide internet linked amateur radio tracking system. Any amateur or university payload can support this mission by simply enabling DIGIPEAT ON on an AX.25 compatible transponder. The users of such a system can be for Boats at Sea, cross country travelers, expeditions, or any other travelers which are far from any existing APRS terrestrial tracking infrastructure. The satellite downlink from such travelers would be fed into the existing worldwide internet linked APRS system by a few permanent ground stations. This dedicated APRS satellite would join our own PCsat, The South African SUNSAT and several other on-orbit experiments that have been conducted over the years to demonstrate this capability. 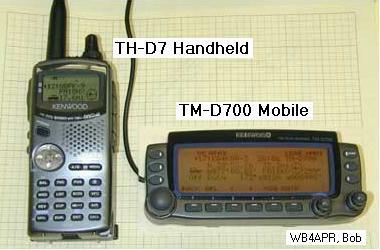 The photo above shows the Kenwood digital packet radios that can be used as the ground user equipment to communicate via these ASTARS compatible satellites. The more of these satellites we can get into orbit, the more continuous the coverage provided to the users. Aalborg University, Denmark <=== New!